Three recurring fears for a homeowner, especially while away from home, are fire, burglary and a sudden water leak. Early detection can limit how far a fire spreads and burglars don't like to break into homes with complex alarm systems. For a sudden leak, even just a few hours away from home can make a huge difference in the cost of recovery. When I had a home-monitoring system put into our house, the installer saw our 105-pound chocolate Lab and 15-pound Lhasa apso and jokingly told us we didn't need a burglar alarm. The little dog would bark rapidly and wake everyone up and the big dog's deeper bark would alert any burglars that big teeth were awaiting them inside. We informed the alarm installer that we were really getting the system for early fire detection and to protect the dogs when we weren't home. To combat some of these fears, Chubb Personal Risk Services has teamed up with two companies to provide two additional service offerings to all Chubb, Legacy ACE, and Fireman’s Fund clients in the United States. 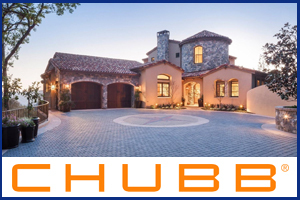 By partnering with ADT Security Services and Sentinel Hydrosolutions, Chubb is now able to offer their policyholders installation and retail discounts on new alarm and water leak detection systems. Installation of these systems may in turn qualify clients for additional savings on their Chubb homeowner’s insurance premium. ADT Security Services is a frequently-utilized alarm provider within Chubb's book of business and their brand is recognizable, but it’s worth noting that Chubb’s partnership with ADT is with a separate division known as the Custom Home Services division. Providing a different strategic focus than local ADT franchises, this new division provides concierge services that are tailored to the high net worth customer. By providing a Chubb dedicated toll-free number for direct live access to an ADT agent, Chubb customers can continue to expect high service standards with this 24/7 service. For more information on this exciting new opportunity, please refer to Chubb's 24/7 marketing brochure. With regards to Chubb’s relationship with Sentinel Hydrosolutions, this service has officially been named the “H20 Damage Defense” service. In this service offering, which also includes its own Chubb dedicated toll-free number for direct live access to a Sentinel agent, Personal Risk customers will get an exclusive discount on the retail cost of Sentinel's state-of-the-art Leak Defense System® that is designed to detect leaks and shut off the water supply to the home. Please refer to the leak marketing brochure for additional information. 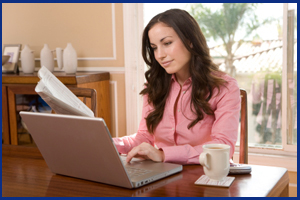 Most new U.S. businesses start at home, so you likely have clients with a homebusiness exposure you don't know about. And thanks to a new online submission process and online direct bill payments, submitting business with the Big "I" RLI Home Business Program is now easier than ever. Isn't my customer's homeowners policy enough? Visit www.iiaba.net/homebusiness to learn more about this product, and to contact your state administrator for a login or submission instructions. By Michael Welch, Big "I" Markets Marketing Assistant Firefighters have many unwritten rules. One I've always liked is, "A falling tree has right of way." A few years ago a house in my neighborhood caught fire. The fire took out most of the second floor and damaged the rafters. The firefighters had to cut holes in the roof to put it out. The owner boarded up the windows and put a huge blue tarp over the roof. About two weeks later, during a big storm a large tree fell across the back corner of the house and crushed the roof of the attached garage. These two unrelated events occurred within less than two weeks but between them they nearly destroyed the entire house. In another claim example, a $750,000 home had not one but two separate instances of flooding from broken pipes, and then a tree fell on it in the same year. In yet another, a coastal condo owner was doing laundry when socks blocked the drain. The condo was completely flooded as was the unit below. These homeowners have a similar problem. Large losses combined with mixed coverage needs. 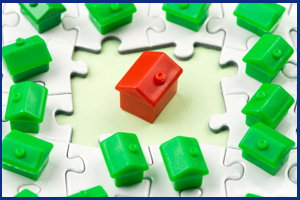 Fortunately Big "I" Markets has coverage for all of them and more with Non-standard Homeowners or Rental Dwelling, Non-standard Condominium Unit Owner, Non-standard Renters,& Vacant Dwelling - Non-standard. While there is no maximum Coverage A limit, there is a $150 - $200K minimum limit that varies by state, and exposure. Available in all states except for Hawaii. DocuSign and IIABA (The Big I) have partnered to bring you a 3 part webinar series on Digital Insurance. Insurers are continuing to evolve and digitize their business to improve workflows. This provides for improved use of time and services provided to customers that improves ROI. Don't wait, register today for part 1 of this 3-part series and learn how other insurance agents and brokers are using DocuSign to improve workflows. October 27. "NFIP: Change, Chaos and Confusion" In this two-hour session, David Thompson of the Florida Association of Insurance Agents teams up with Chris Heidrick of Heidrick and Company in Sanibel Island, Florida to bring you up to speed on where we were and (as best as anyone knows) where the NFIP is going. Subjects such as subsidized rates, grandfathering, refunds, surcharges, lapses, and the ever-popular robust private flood insurance market will be discussed. Click here to learn more and register. Two weeks ago we took a look at GEICO and their highest penetration states for auto insurance. This was in consideration of potential changes in automobile insurance arising out of societal changes. GEICO premiums of their largest “dec page insurer” seemed to be more coastal and less central (LINK). This week, we look at the industry’s largest writer of automobile insurance, State Farm Group. What do you see in your agency’s crystal ball for competition from State Farm five years from now? Almost two-thirds of State Farm Group premiums are in automobile insurance. If predictions of self-driving cars and services like Uber have individuals insuring fewer cars, how will State Farm adjust? It writes $1 of every $6 of automobile insurance premiums and auto is two-thirds of their premiums. Perhaps surprising is that State Farm is as big as they are in commercial. 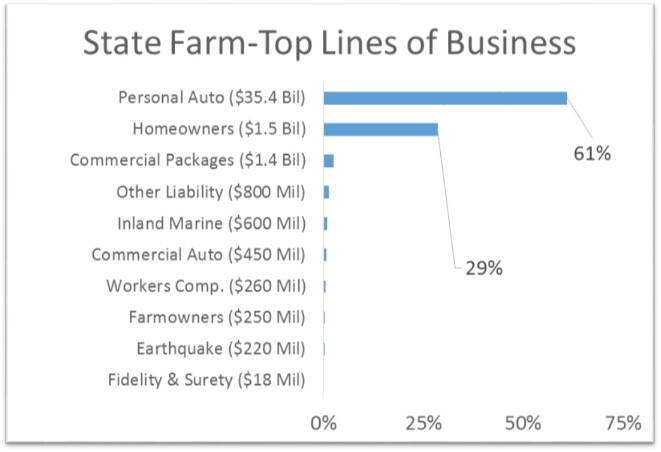 While commercial has not been State Farm’s main emphasis, when you are the biggest insurer in the country, you get to $5 billion in commercial premiums pretty quickly and that puts State Farm in the Top Ten of all insurer groups in combined commercial lines. Source: A.M. Best 2015 Aggregates and Averages: 50 Leading Groups By Line of Business (Shown above are Net Written Premiums for 2014 and percentages are of total net written premium for all State Farm Group. Congratulations to our agent in Missouri on a casual dining restaurant sale of $6,747 in premium!